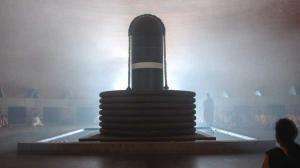 “Dhyana” in Sanskrit means meditation and “linga” means the form. 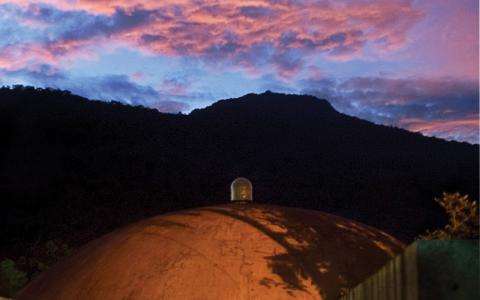 Dhyanalinga is a profound meditative space that does not ascribe to any particular belief or faith, and requires no ritual, prayer or worship. 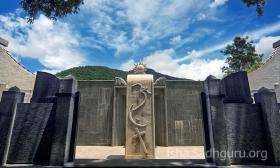 A powerful and unique energy form, Dhyanalinga is a doorway to enlightenment and spiritual liberation. 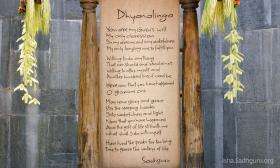 In the metaphysical sense, Dhyanalinga is a guru, offering spiritual seekers the opportunity to do spiritual practices in the utmost intimacy of a live guru, something traditionally available only to a few. Though it has always existed in the yogic lore, there is no reference to a Dhyanalinga in the scriptures. It has always been the dream of many enlightened beings, but the complexities involved in its creation are such that it rarely materialized. 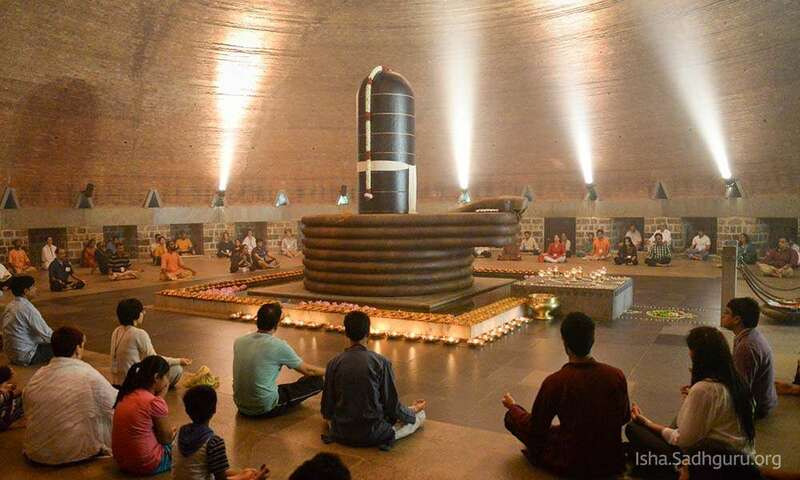 The closest attempt to consecrate a Linga like this took place almost one thousand years ago in Bhopal, India. The process, though grand, failed in the final stages. Today, we are fortunate to be alive as its phenomenal presence graces the world. Dhyanalinga was consecrated by Sadhguru on 24 June 1999, after three years of an intense process of prana pratishtha – a pure energy process wherein the energies of all seven chakras are raised to the peak and locked to prevent dissipation over time. 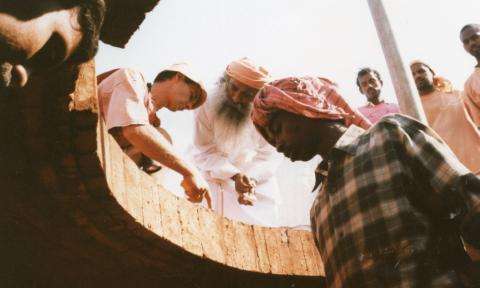 On 23 November 1999, Dhyanalinga was offered to the world. 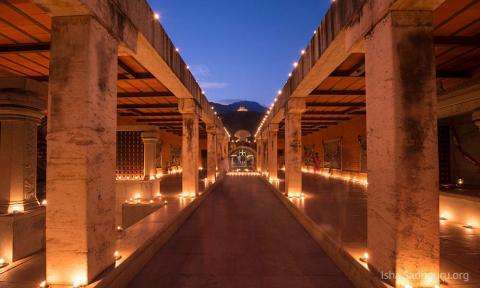 The Dhyanalinga is open every day from 6am to 8pm. 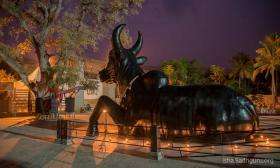 On Shivratris, the timings are 6:00am - 4:00pm, 6:15pm - 8:00pm. 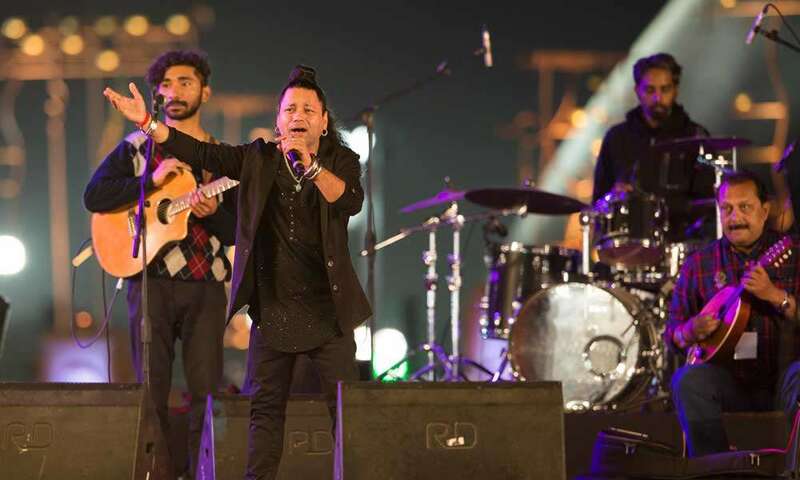 There are several events that occur on a daily basis, such as Nada Aradhana or the offering of sound, Aumkar initiation, and the Isha Kriya guided meditation. Nada Aradhana at Dhyanalinga: 11:45am - 12:10pm, 5:45pm - 6:10pm. 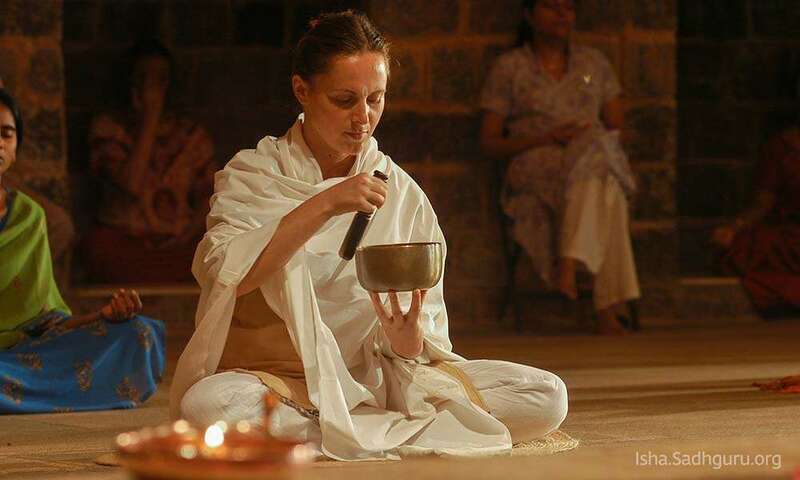 Nada Aradhana is an offering of sound to the Dhyanalinga, an etheric blend of vocals, singing bowls, drums and various other instruments that takes place twice daily during the Sandhya Kalas. Nada in Sanskrit means “sound” and Aradhana signifies “devotional offering”. Visitors coming to the Isha Yoga Center can be initiated into the timeless and powerful mantra "Aum". The mantra activates and energizes the various sections of the body, reverberating through the whole system. Furthermore, it can bring peace and balance to the meditator's system, and is known to relieve people from numerous physical and mental ailments when practiced regularly. Isha Kriya is a simple yet potent process rooted in the timeless wisdom of the yogic sciences. 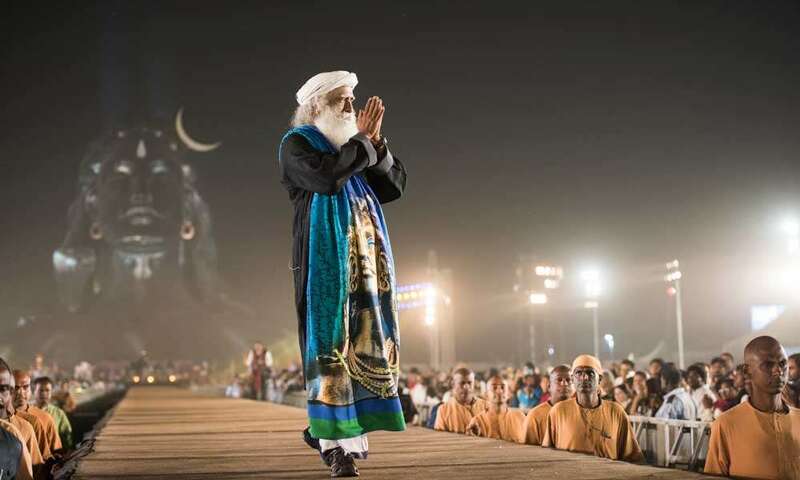 Offered by Sadhguru, it has the potential to transform the life of anyone willing to invest just 12 minutes a day. 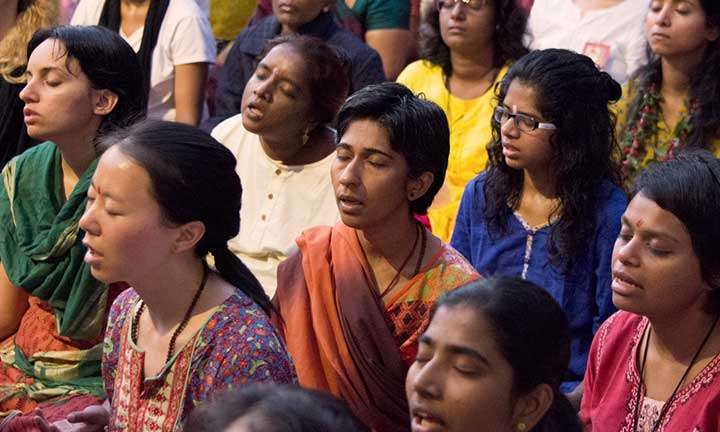 Daily practice of Isha Kriya helps brings health, dynamism, peace and wellbeing. It is a powerful tool to cope with the hectic pace of modern life. 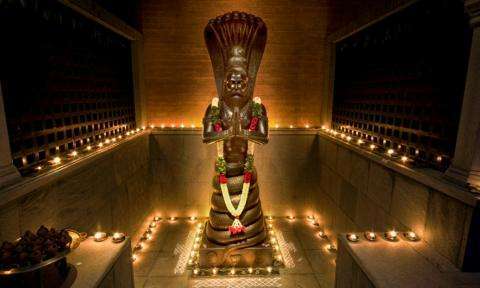 On certain days, the days the Dhyanalinga undergoes a cleansing process called Linga Snanam. 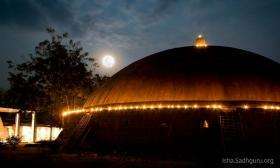 Overseen by the Brahmacharis and Sanyasis, this happens every week – particularly before and after the Purnima (full moon) and Amavasya (new moon) days. 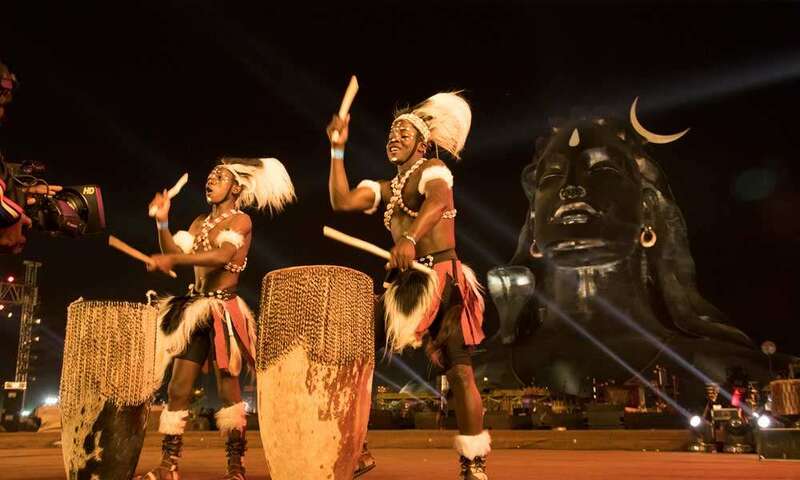 You have the opportunity to participate in the Linga Snanam. 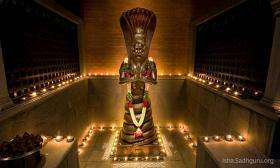 Dhyanalinga has been created as a very powerful presence so that the vignanamaya kosha or etheric body of a person is touched just by being in its sphere. 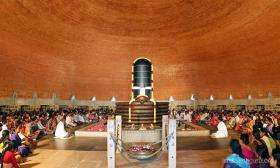 To experience the Dhyanalinga, sit and gaze at the linga for a few minutes. Then close your eyes, palms facing upwards, resting upon your lap. The Dhyanalinga requires no pooja, prayer or worship. There is no need to concentrate or try to meditate. Just sitting silently for a few minutes is enough to make even those unaware of meditation experience a state of deep meditativeness. 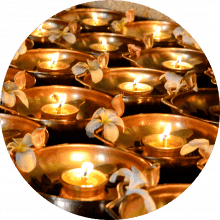 To be most receptive to the Dhyanalinga, the best way is to be there as an offering – to make an offering of oneself. 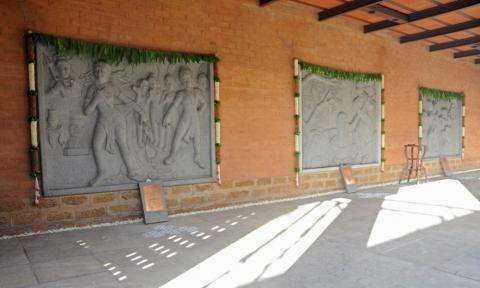 Taking a dip in the Chandrakund or Suryakund before entering the Dhyanalinga can also help enhance one's receptivity to the Dhyanalinga's energies. To maintain the silence and sanctity of the space, a bell rings every 15 minutes to indicate when you can enter and leave. Please stay for at least 15 minutes to allow yourself to experience the energies of Dhyanalinga. 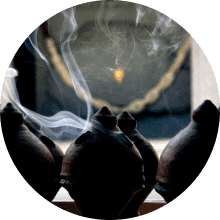 The fragrance of dhoop lends a supportive ambiance for the spiritual possibility. Offerings of dhoop can be placed on the table adjacent to Patanjali. In Indian spirituality, a lotus is a symbol for spiritual growth. Fresh lotus flowers can be offered at the jalaseema, the water body surrounding Dhyanalinga. 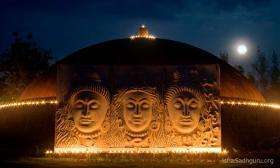 Linga Jyotis, unique lamps made of copper and brass, have been designed by Sadhguru as a symbol of purification and light. 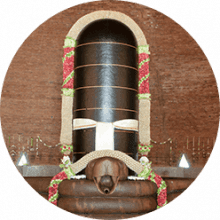 A Linga Jyoti can be offered during a visit to Dhyanalinga, or purchased to preserve and radiate the energies of Dhyanalinga at home. An abundance of fresh flowers, exquisitely arranged as malas (garlands) are offered every day, spreading a sense of natural beauty, color and fragrance. 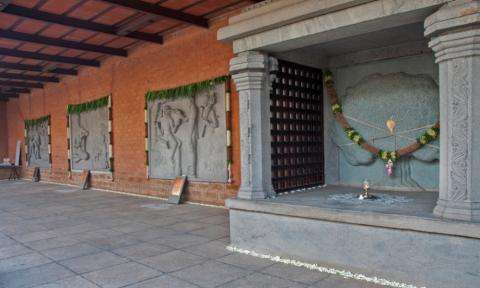 Malas can be offered individually or together to Dhyanalinga, the Naga, the panels in the Dhyanalinga inner parikrama, Patanjali, Vanashree or the avudiyar. 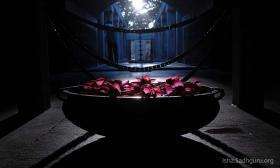 The offering can be made on special occasions of celebration, in remembrance of loved ones or simply as an expression of gratitude. There is a natural upsurge of energies in the human body on the days of Amavasya (new moon) and Purnima (full moon). As a result, they are held as days of significance for the spiritual seeker. 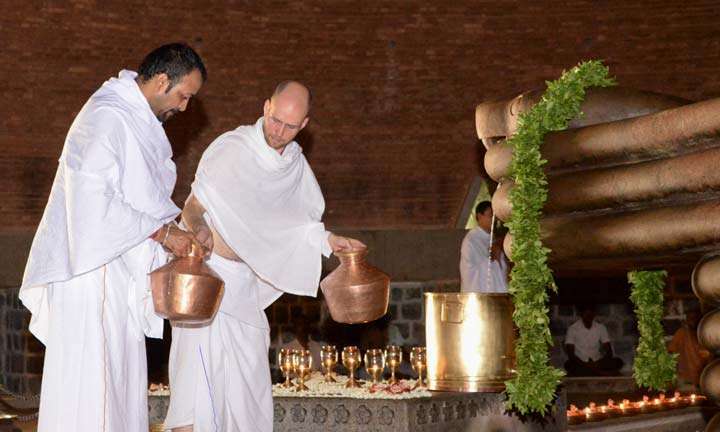 On these two days, one can have the rare privilege and honor of personally making an offering of ksheera (milk) or jala (water) upon the Dhyanalinga. Ksheera is offered from 6am to 12:30pm and jala from 12:30pm to 8pm. 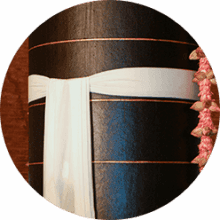 Devotees have the opportunity of offering a linga vastram (cotton or silk), the sacred cloth draped on the Dhyanalinga, or to take an energized linga vastram home. 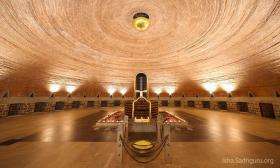 Keeping the linga vastram in a shrine, meditation room or pooja room at home will transform the atmosphere of that space. Those who wish to contribute can contact +91-83000-83111. 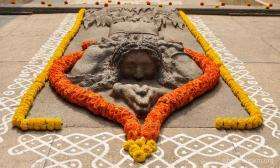 The Pancha Bhuta Aradhana makes use of the system of yoga called Bhuta Shuddhi, which means, “the purification of elements,” to cleanse the five elements – earth, water, fire, air and space – in the human system. 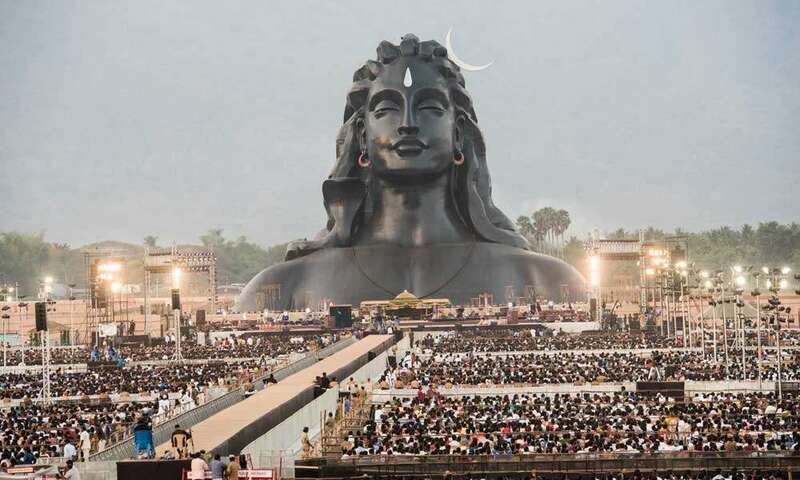 Mahashivratri, one of the largest and most significant among the sacred festival nights of India, celebrates the Grace of Shiva, the Adiyogi, from whom yogic sciences originate. The planetary positions on this night are such that there is a powerful natural upsurge of energy in the human system. It is enormously beneficial for one’s physical and spiritual wellbeing to stay awake and aware in a vertical position throughout the night. 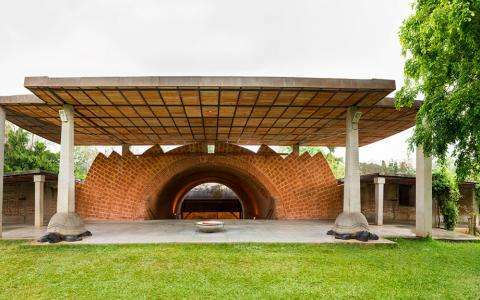 A Linga or perfect ellipsoid can be energized in various ways, to serve different purposes. It is one form that when energized, becomes a perennial storehouse of energy. 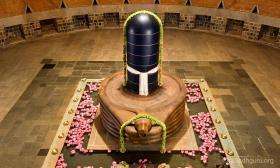 The yogic science of making a Linga is based on this knowledge. 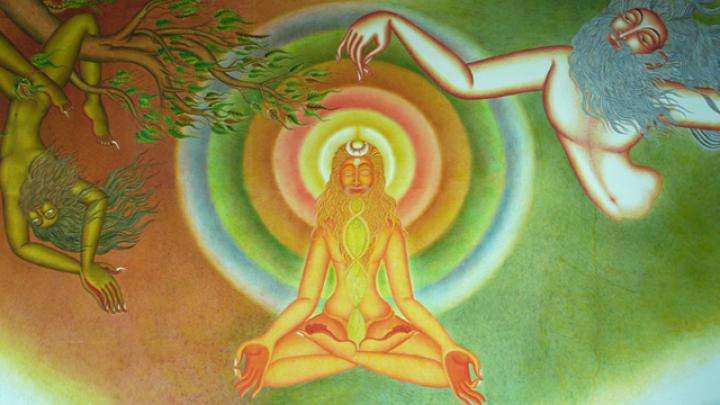 Dhyanalinga is the distilled essence of yogic sciences. 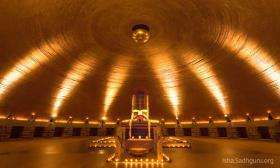 In the Dhyanalinga, energy has been pushed to its highest point and locked through an intense process of prana prathistha¹. As Sadhguru describes it, the Linga form allows energy to be brought to the highest intensity at which it can still retain a form. Beyond that, it moves into formlessness. 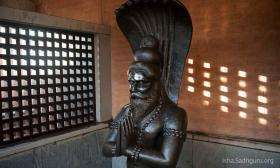 The physical form of Dhyanalinga - the black granite stone - is just scaffolding for this energy form. Even if this were to be removed now, the energy form that exists there cannot be destroyed. It is eternally present and available to all. 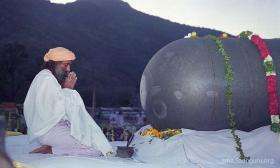 The below articles explore various aspects of the science and mysticism behind the making of Dhyanalinga. In ancient temples, the structure that houses the Deity is as important as the Deity itself. 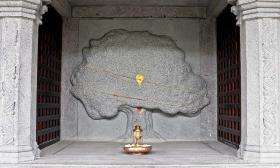 The parikrama or the walkway of the temple, the garbhagriha or the innermost shrine of the temple, the shape and the size of the idol, the mudra held by the idol and the mantra (sound) used for the consecration of the temple are the fundamental parameters of a temple. These elements are matched and built according to a certain science based upon an understanding of energies, thereby creating a powerful energy situation and facilitating inner transformation. 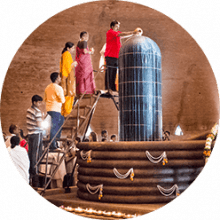 The energies of the Dhyanalinga have been consecrated to last for more than 5000 years without any dissipation. 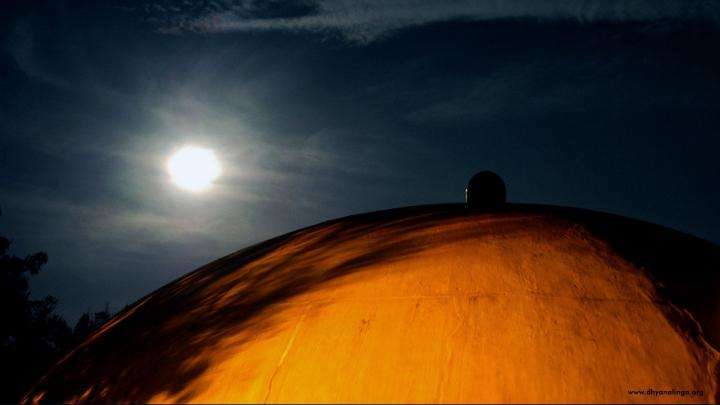 The elliptical dome that houses the Dhyanalinga is 72’ and 4” feet in diameter and 33 feet high. It was built without the use of any steel, cement, or concrete but with brick and mud mortar stabilized with lime, sand, alum and herbal additives. It's the only structure of its kind. The simple technology used is this -- all the bricks are trying to fall down at the same time! But, the way the bricks are aligned and balanced, they can never fall. 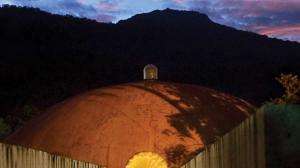 The nature of this design ensures a lifespan of at least 5000 years for the dome. 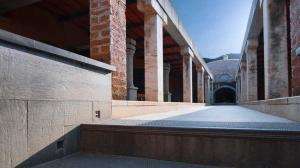 Read more about what went into the construction of this unique space and also the ancillary features in the premises. Learn about Nandi, Trimurti Panel, Suryakund and Chandrakund and other features in the vicinity of Dhyanalinga. 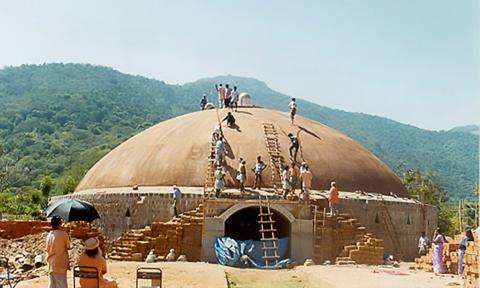 A behind-the-scenes look into what went into the making of the sanctum sanctorum or garbhagriha of Dhyanalinga's dome. 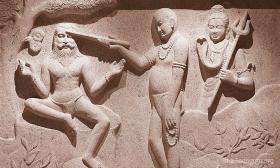 Read about the symbolism and inspiration conveyed in the beautiful stone reliefs and sculptures of the inner parikrama. Sitting there for 15-20 minutes put me on a wonderful and beautiful mystical spiritual path to the ultimate. This a very very special place. Very very energetic and meditative. Wonderful place.